Thumbs up from John Lewis! 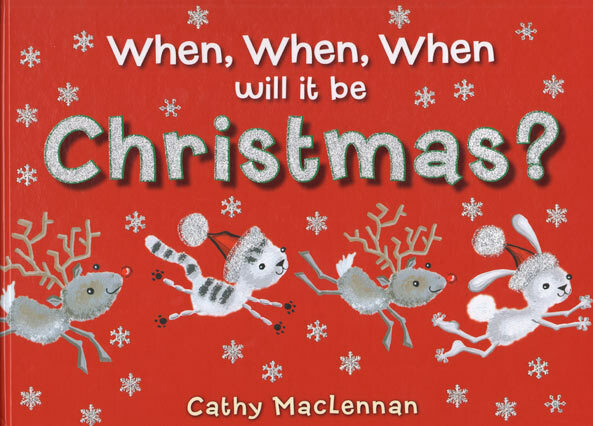 So pleased to hear that my Christmas book 'When When When will it be Christmas?' is being sold in John Lewis stores! They say "This wonderfully festive read-along picture book features vivid illustrations and a heart-warming winter tale. 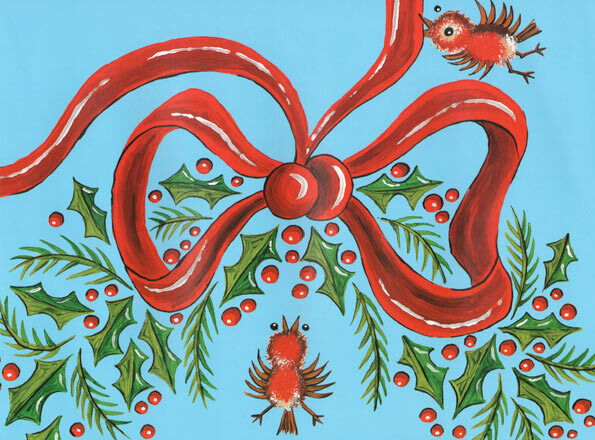 Perfect for family gatherings around an open fire, this charming children's book will make the countdown to Christmas even more magical." 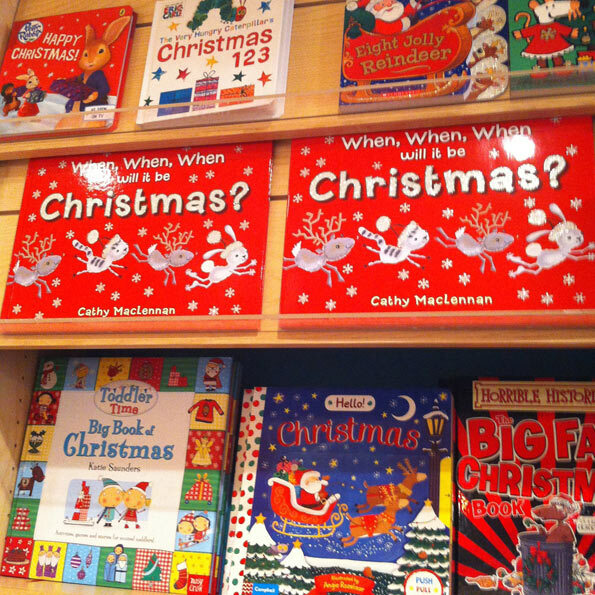 October 2nd 2014 saw my fifth picture book When When When will it be Christmas? published by Boxer Books. Have had a great review from the all important Publisher's Weekly in the US extolling both the pictures, colour block book design and the drumming up of pre-Christmas excitement in the text. 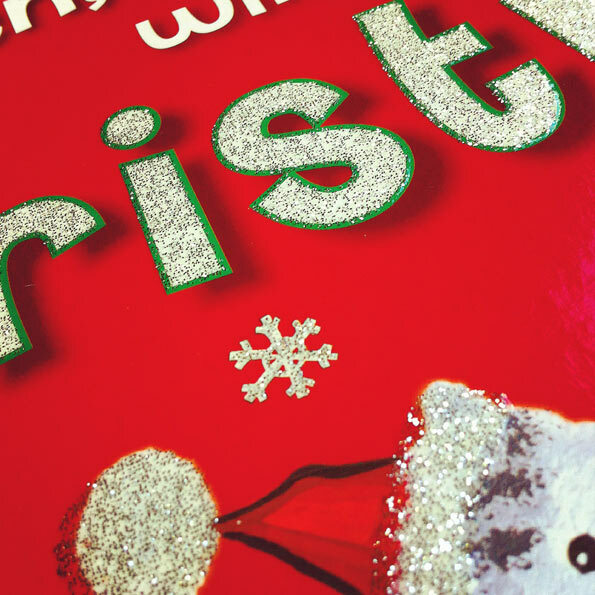 It even has glitter 'bling' on the very red cover! 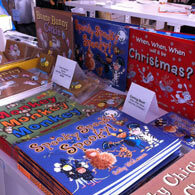 Have sold loads of copies myself and pleased with how it stands out so well on the shelves of bookshops. 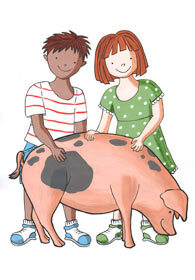 Fingers crossed it sells well and that lots of children enjoy it. It's going to be a busy run-up to Christmas this year! Now where's my Santa hat? After much preparation for the event, myself and artist Lesley Redmond took part in Wokingham Arts Trail over the weekend 27th/28th September. Thanks so much to our host Kerry Goodrich of Goodrich Bespoke for offering a great venue right in the centre of town. 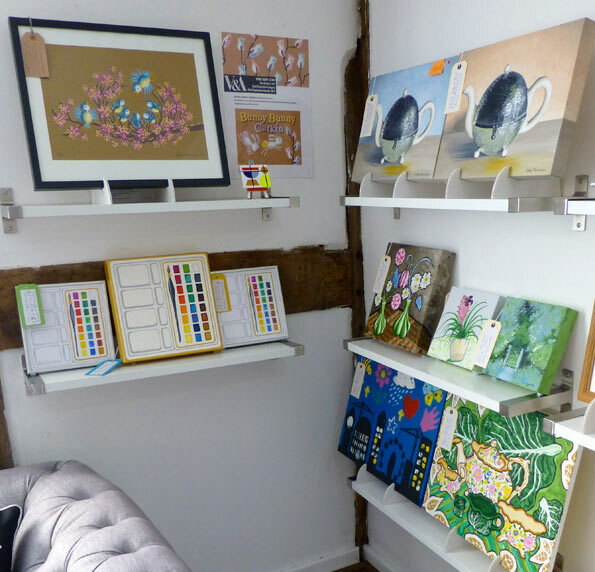 Whilst I exhibited my books, limited edition prints, original illustrations, cards, hand-painted gifts and even some paintings, the live bespoke tailoring offered a fascinating backdrop to the art. We had hundreds of visitors and fabulous weather for all those doing the whole trail. 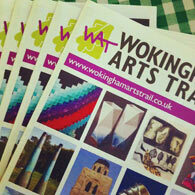 Just preparing lots of things to sell alongside my books at Wokingham Arts Trail at the end of September. 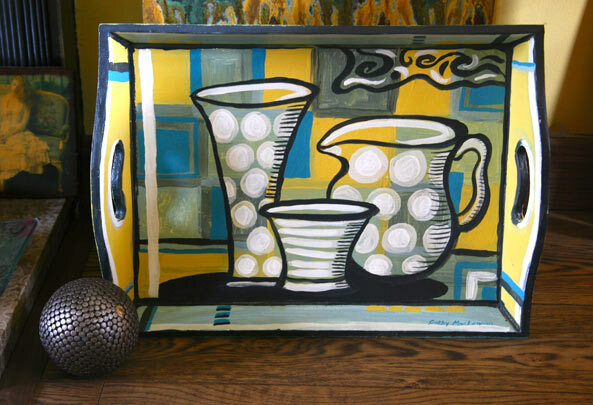 Original painted editions, limited edition prints of illustrations, mini-canvases with easels and hand-painted cards. I've not sold any of these before so it will be interesting to see how they sell. Thinking about some gift wrap too, but it's very pricey to get it printed. We will see! 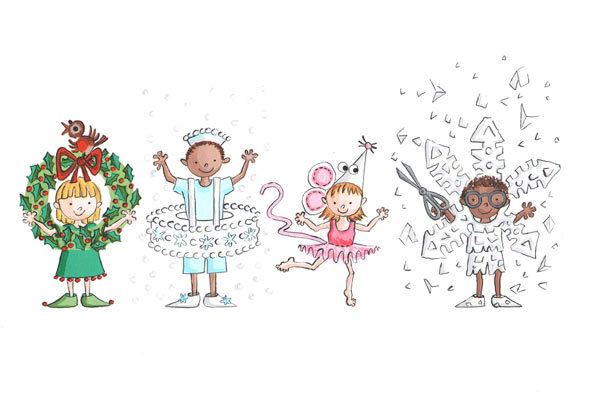 I have just finished a Christmas picture book for Boxer Books, due to be published in October 2014, entitled 'When When When Will It Be Christmas?' 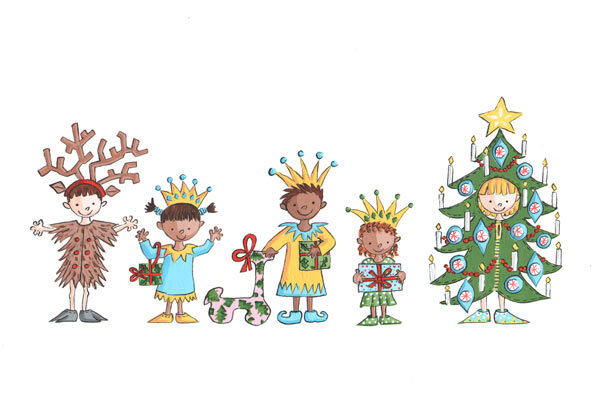 It's all about the excitement of getting ready for Christmas and the long wait for the big day itself! More news later on this, but meanwhile here are a few sample, unfinished pics of some of the characters. 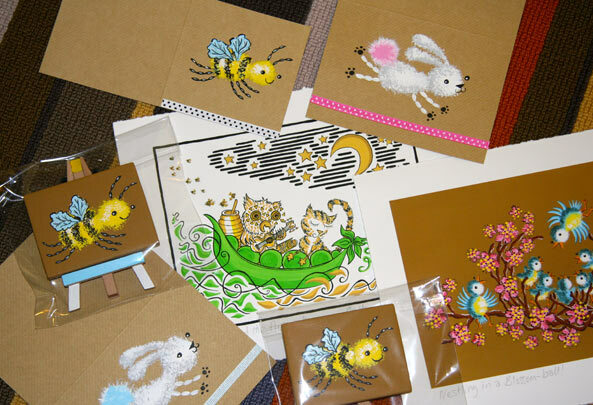 The illustrations are all done on white, which is unusual for me, as I usually paint straight onto coloured Kraft paper. For a more contemporary look to this new book, we are still editing and deciding on coloured digital backgrounds for each page/illustration. I have been busy producing some illustrations for the younger visitors to the current 'Reading At War' exhibition at Reading Museum. 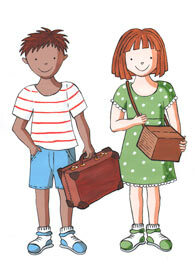 I was asked to produce two, contemporary child characters with a variety of war objects. They have been used alongside some fascinating facts, relating to each war with which Reading has a link - from the Iron/Bronze Ages right through to World War Two. They look deceptively simple. However, they were actually quite a challenge, but an enjoyable project neverthless! 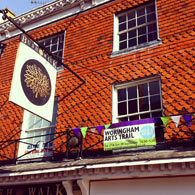 The exhibition is showing until September, so take a look if you are visiting Reading. 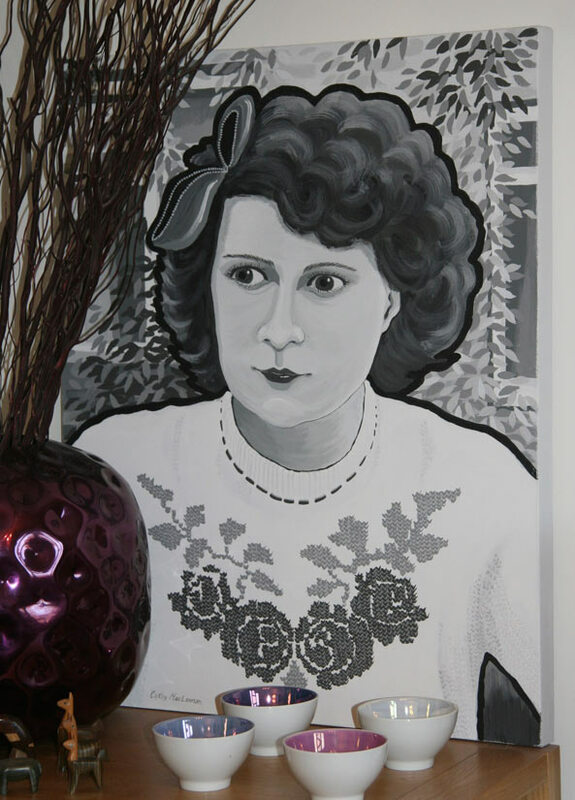 I recently completed a painting of my mother. It is the first in a planned series of paintings called Half Memory. I am trying to explore the difficulties of remembering, in particular faces and people, but sometimes places too, or events. If you shut your eyes and try to accurately remember a much loved and familiar face, it is actually very hard. We tend to fabricate things and add or take away from reality. So this image has a rather mask-like or paper doll quality. It is a portrait of sorts, but is also an illustration and an interpretation, which is how memories are. 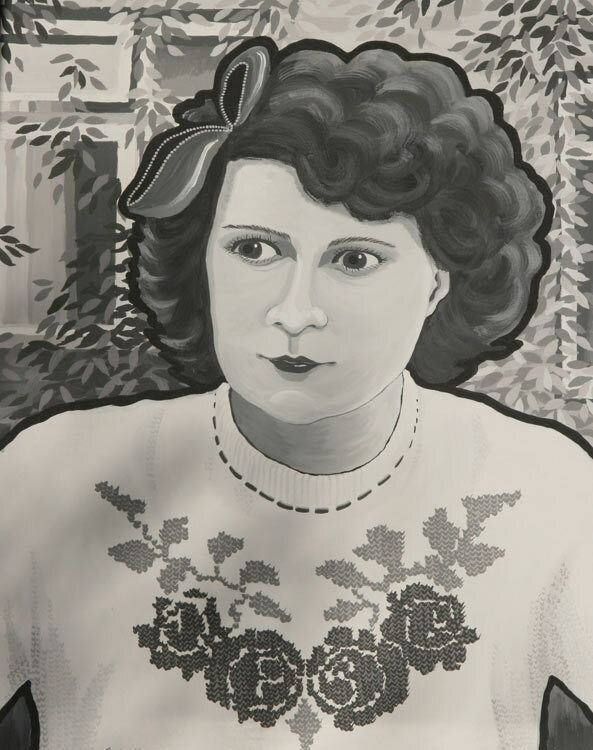 I have started two further paintings, but it will be a while until I can work on these again, as I am currently working on illustrations and a new book. Last year I designed a rug. A large rug! It was made in Nepal by Fairtrade company Node. 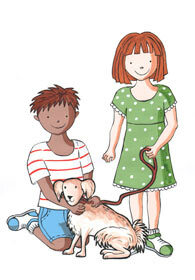 I was introduced to Node by the very talented children's author/illustrator Chris Haughton who set up the Fairtrade company with Akshay Sthapit to connect a worldwide group of designers with traditional Nepalese rug makers. 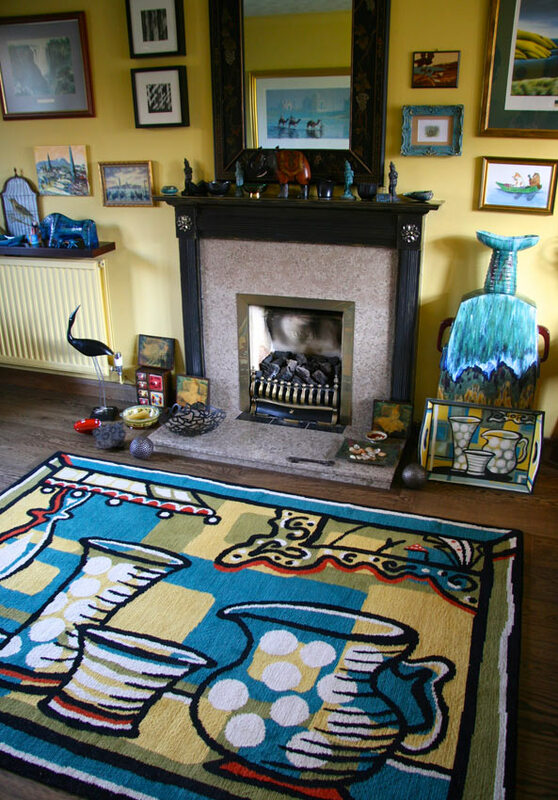 The rugs have really caught the eye of the design world and are available to buy at the Design Museum in London. 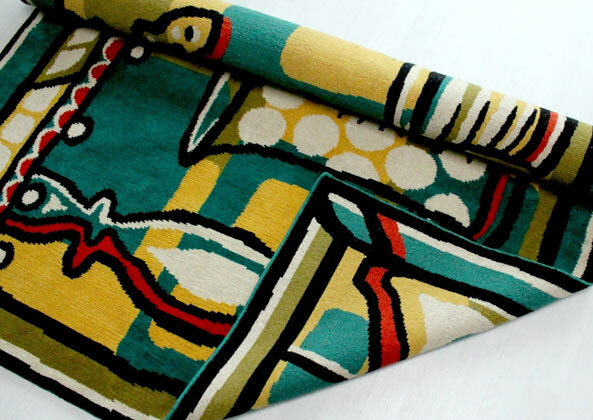 I ended up designing my own rug simply because I was unable to find what I wanted. 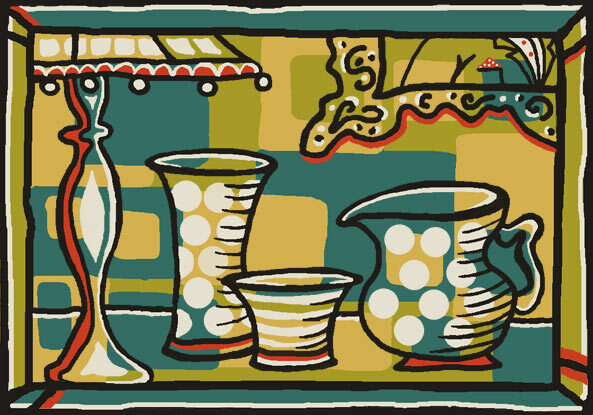 I was looking for something contemporary and graphic with a striking colour palette. I also like black and that's not easy to find on a rug either. 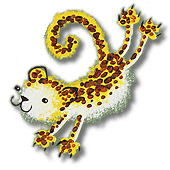 So with the aid of PhotoShop and colour swatches downloaded from Node, I designed it pixel by pixel. 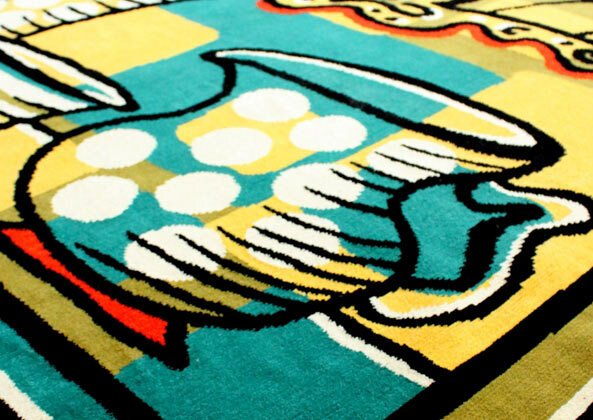 The original design was on a tray, followed by the digital version - and finally a real rug! More news about that soon! Meanwhile here are some pictures.